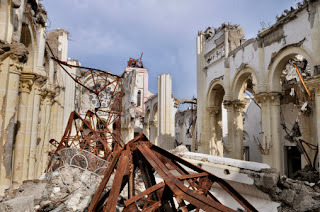 The media coverage is extraordinary on the powerful earthquake (measuring 7.0 on the Richter scale) that struck near Port Au Prince, Haiti on January 12. Our heartfelt thoughts and prayers go out to everyone who is suffering right now in Haiti. The President has been receiving updates on the urgent situation in Haiti late into last night and throughout the day, and top members of his team have been convening to formulate the government response. You can also help immediately by donating to the Red Cross to assist the relief effort. Contribute online to the Red Cross, or donate $10 to be charged to your cell phone bill by texting "HAITI" to "90999." Find more ways to help through the Center for International Disaster Information. Families of Americans living in Haiti are encouraged to contact the State Department at 888-407-4747.